Jester King is an authentic farmhouse brewery committed to mixed culture and spontaneous fermentation. Our beers incorporate well water, local grains, hops aged in our barn, local fruits and vegetables, foraged plants, and native yeast and bacteria so as to make beer uniquely tied to a time, place, and people. Our inspiration comes from the classic farmhouse breweries of Europe that embrace principles of subtlety, restraint, patience, full attenuation and interesting fermentation character. We mash Texas-grown barley and wheat from Blacklands Malt in Leander with unfiltered Hill Country well water. We boil with fresh hops and hops that have aged in the attic of our barn for years. All our beer is 100% spontaneously fermented with airborne yeast and bacteria or fermented with a mixed culture of wild yeast and bacteria cultured from the flora that grows around the brewery. Our beers fermented in stainless steel with more hops tend to be dry and bitter, whereas our beer fermented in oak barrels for months and years is tart and funky. We created our mixed culture from a blend of brewers yeast and yeast cultured off the skin of local plants and wildflowers. It leads to unpredictable fermentations that are uniquely tied to place. Our mixed culture is the line that tethers our beer to the land more than anything else. In the winter time, we let wort (unfermented beer) rest overnight in our coolship and become inoculated with native yeast and bacteria. We then move the wort to oak barrels and allow it to spontaneously ferment without pitching any yeast or bacteria. The beer will mature and slowly develop complexity over the course of one to three years. 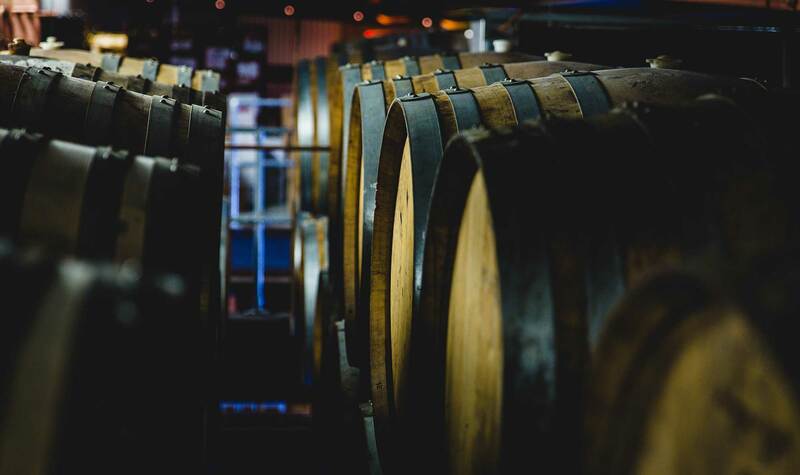 We age beer primarily in neutral barrels that previously contained wine. Yeast and bacteria living in the pores of the wood slowly shape the character of the beer as the months and years progress. We prefer neutral barrels so that the delicate, nuanced flavors and aromas from wild fermentation can shine through. Blending is where the human element in beer making comes into play the most. We select barrels with disparate flavors and aromas that combine together to make a cohesive whole. We seek to create blends that are balanced and drinkable with interesting yeast character and mellow acidity. At Jester King, we're fond of blurring the lines between wine and beer. We take real fruit (nothing artificial) from the Texas Hill Country and ferment it with our beer. The indigenous yeast and bacteria in our beer break down the sugars in the fruit to create a result that's greater than the sum of its parts. All our beer, whether stainless or oak, mixed culture or spontaneous, fruit refermented or not, is unfiltered, unpasteurized and 100% naturally conditioned through refermentation in bottles and kegs. During refermentation, the beer goes through a series of phases and textures as it slowly develops microbiologically. While our beer is typically ready to drink after two to six months, it will continue to slowly evolve over time as it is alive. Jester King currently preserves 58 acres of land in the Texas Hill Country. As Austin grows and green space becomes less common, we will continue to preserve our small piece of the Hill Country. In 2016, we began farming and currently grow a variety of fruits and vegetables. This year, we planted a three acre vineyard. We also raise goats and will add to the diversity of our livestock over time.